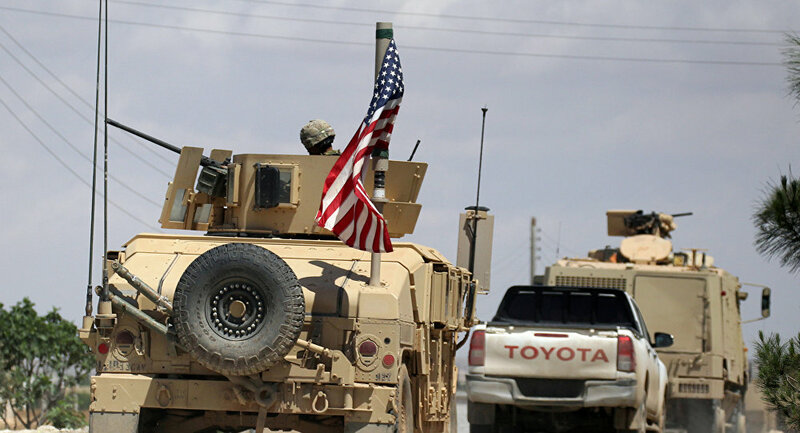 Two convoys of US forces totaling 12 vehicles arrived on the outskirts of Manbij on Monday, deploying in the villages of al Saeidah and Awn al Dadat, Sputnik news agency has reported. The news follows reports by Turkish media that the US had replaced Kurdish militias which formerly governed the town with a ‘Manbij Local Council’, supposedly consisting of members of these same militias, except flying different flags. It was reported over the weekend that Turkey deployed its seventh convoy to patrol Manbij’s outskirts. A commander of a local military council affiliated with the Syrian Democratic Forces told the Source earlier that the US had established a new base at the entrance to Manbij, with the base joining two other bases along the road to Aleppo and in the town of Eyn Dedat. There are some 5,000 troops deployed at over 20 US military bases in northern Syria in areas controlled by the Syrian Democratic Forces, an alliance of predominantly Kurdish militias including the YPG People’s Protection Units. Ankara classifies YPG as a terrorist organization affiliated with the Kurdistan Workers’ Party, outlawed in Turkey, and launched a military operation against them in January 2018. Last month, Secretary of State Mike Pompeo and Turkish Foreign Minister Mevlut Cavusoglu endorsed a ‘roadmap’ aimed at ensuring stability in the town and its outskirts including the scheduled withdrawal of YPG units from the area. US support for the YPG prompted increased tensions between Washington and Ankara. Damascus has condemned the Turkish-US agreement on the Syrian town, and called the two countries’ presence in northern Syria “aggression.” Last week, US media reported that President Trump was hoping to clinch a deal with President Putin which would allow the US to withdraw from Syria at their Helsinki summit on July 16.